We’d love your help. Let us know what’s wrong with this preview of Big & Little Questions by Julie Bowe. A Publishers Weekly and Barnes & Noble Best Book of the Year about Wren Jo Byrd, a nine-year-old introvert whose life has gone topsy-turvy ever since her dad moved out. "By turns heartbreaking and heartwarming--exactly like real life. Julie Bowe takes on the tough questions about what it means to be honest, to be a good friend, and to be a family, and offers answers tha A Publishers Weekly and Barnes & Noble Best Book of the Year about Wren Jo Byrd, a nine-year-old introvert whose life has gone topsy-turvy ever since her dad moved out. It's the start of a new school year and Wren Jo Byrd is worried that everyone will find out her parents separated over the summer. No one knows the truth, not even her best friend, Amber. When even her new teacher refers to her mom as Mrs. Byrd, Wren decides to keep their divorce a total secret. But something else changed over the summer: A new girl named Marianna moved to town and wants to be Amber's next bff. And because of her fib, Wren can't do anything about it. From take-out dinners with Mom to the tiny room she gets at Dad's new place, nothing is the same for Wren anymore. But while Marianna makes everything harder at first, Wren soon learns that Marianna once had to ask many of the same questions--the big ones, as well as the little ones--that Wren is asking now. To ask other readers questions about Big & Little Questions, please sign up. Big & Little Questions (According to Wren Jo Byrd) is a delightful book that deals with a common family issue in a realistic and important way. For any child who has ever been in the middle of parents who are divorcing, it can be a scary and trying time. There are so many questions, and kids can often be left wondering if it is their fault, or whether or not the parents are going to get back together and fi Check out this and other reviews on my young adult book blog, Here's to Happy Endings! For any child who has ever been in the middle of parents who are divorcing, it can be a scary and trying time. There are so many questions, and kids can often be left wondering if it is their fault, or whether or not the parents are going to get back together and fix the family. The children who are dealing with their parents separating might be broken, while the friends of those children might find themselves wondering "what if that happens to me?" It can be a lonely time for the children of parents who are splitting up, but it doesn't have to be - and Big & Little Questions (According to Wren Jo Byrd) offers a main character who is both hurting and in denial about her parents divorcing, all while trying to keep the rest of her life together, too. "When your parents decide to get a divorce, someone has to leave." Wren Jo Byrd doesn't understand why her parents are splitting up. After all, her family has always been great together! At nine years old, Wren has some of the best memories with both of her parents - why on Earth would she want them to split up and live in different places? But Wren's parents are sure, and come to the decision that they are no longer going to stay together, leaving Wren's dad to move out across the lake into a cabin, which he is also fixing up, and Wren is sent to spend the summer with her grandparents, instead of hanging out with her best friend Amber and enjoying swimming and all kinds of other fun things that summer brings. When Wren comes back from her grandparents' home, she is still heartbroken to see that her life really is changing - the schedule on the fridge is a constant, nagging reminder of how different her life is going to be. Monday through Thursday Wren is to meet her mother at the library where she works, while on Friday afternoons she takes the bus to her father's cabin for the weekends. Since Wren was too scared to text Amber or her other friends all summer long, fearing what she and others would think if they found out that Wren's parents were divorcing, she stayed silent and didn't talk to anyone - leaving Amber to find a new best friend. The new girl, who is at first rude to Wren and brags about how wonderful her life is, has taken Wren's place as Amber's best friend, and Wren is heartbroken about this, too. But over time, Wren and the new girl spend more and more time together, getting to know one another and picking up on each other's secrets - maybe this new girl has something to hide, as well? Maybe Wren can find a friend where she wasn't sure she would, and maybe she will be able to come to terms with her parents getting a divorce. This book was charming and had a really sweet main character who was simply trying to navigate a world that was breaking apart right in front of her - from her family to her best friends, leaving her unsure as to where she belongs. While Wren tries her hardest to keep her parents' impending divorce a secret, she finds herself telling one small lie after another, stressing herself out, and fighting to keep a friend who doesn't understand that everything in her life is different now. I loved Wren - she was so honest and inquisitive, often looking up words in the dictionary until she truly understood what was what (after plenty of encouragement from her mother, who works as a head librarian at the town's library). Wren tries to keep it all together, but sometimes it's just too hard for her, and she can't keep it in anymore. After all - how is a nine year old supposed to handle everything in her life changing, and not for the better? The chapters in the book are titled with questions that Wren finds herself asking in the book - sometimes goofy, and sometimes questions that will tug at your heartstrings and make you feel everything that Wren feels. The author did a great job channeling a nine year old girl, and she is definitely a character that young children, middle graders, and even adults can find themselves relating to. She's funny and she's sweet, and she has an adorable pet cat named Shakespeare that I thought was such a great touch for this book. With focuses on family and friendship, this is definitely a great middle grade read! Wren has had to spend the summer with her grandparents because her parents are divorcing, and she is too scared to tell her best friend Amber why she had to be gone, so didn't even explain why she had to miss Amber's birthday party. In Wren's absence, Amber has become good friends with the new girl, Marianna. Marianna lives in a big house and is very stylish and snobby-- she calls Wren "Tweety" in a mean way that she claims is joking. The school year is difficult for Wren, who tries to hide the fact that her parents are living separately, even though she has to take the bus to her father's after school. Other things are changing, too-- at recess, the girls no longer want to pretend to be horses, but talk about boys and lip gloss. Wren slowly comes to accept her parents situation, her mother and father go on with their lives, and Wren starts to understand that things are not perfect for Marianna, either. Strengths: This was a great way to present some serious elementary issues-- Wren's emotions are given the attention they deserve, but her life isn't overly sad. She hides things that are bothering her, and is able to get help when she finally seeks it. This seems like a pitch perfect way to describe one girl's reaction to her parents' divorce and the even more traumatic loss of her best friend to a girl who is mean to her. Really enjoyed this one. Weaknesses: Not thinking of any. Even Wren's mom's insistence that Marianna walk with Wren to the library one day a week is something that is completely realistic. I guess I would have preferred if Wren had been a 7th grader, because I do deal with students of this age who are experiencing divorce and friend drama. What I really think: This is perfect for elementary school, but the emotions surrounding this issue are different enough in middle school that I don't think it will work in my school. A definite purchase for elementary libraries, however. First sentence: Lots of things have changed since my last first week of school. Premise/plot: Wren Jo Byrd is the heroine of Julie Bowe's newest book, Big & Little Questions. She has had a whole summer to get used to the idea of her parents getting a divorce, but, she hasn't really accepted it and is not willing to talk about it. She's spent most of the summer out of town, and, she hasn't spoken to--or texted--her best, best friend, Amber. Wren wants to reconnect with Amber now that school ha First sentence: Lots of things have changed since my last first week of school. 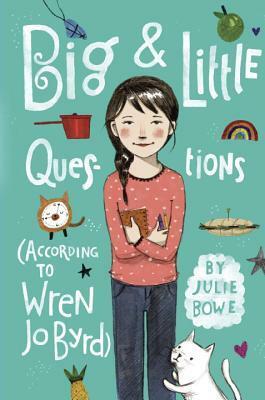 Premise/plot: Wren Jo Byrd is the heroine of Julie Bowe's newest book, Big & Little Questions. She has had a whole summer to get used to the idea of her parents getting a divorce, but, she hasn't really accepted it and is not willing to talk about it. She's spent most of the summer out of town, and, she hasn't spoken to--or texted--her best, best friend, Amber. Wren wants to reconnect with Amber now that school has started, but, Amber isn't making it easy for her. Why didn't Wren call? text? send a postcard? write a letter? Why didn't she come to her birthday party? Why didn't she let her know she wasn't going to be in town? Why the silent treatment? Wren has questions of her own. BIG and LITTLE questions as you might have gathered. Why did Amber replace her so quickly with the new girl? Why is Amber's new best friend, Marianna, so mean? Why does Marianna tell lies and bully people? Why can't things be the way they used to be? Complicating matters of friendship is the divorce. Wren still doesn't want Amber to know about it. Wren is hiding the fact that she spends the weekends--Friday afternoon through Sunday afternoon--with her father in his new place. Wren finds herself lying to her friends almost daily. She doesn't like it, but, once she gets started, she doesn't know how to stop. Yet Wren doesn't see herself as a liar, Marianna is the liar, after all. Marianna and Wren spend time together throughout the week after school, Marianna walks her to the library--where her mother works--and often they do homework together. (Marianna is being raised by her stepfather. Her mother hasn't made the move yet.) Readers see the 'real' Marianna before Wren does, in my opinion. Unexpectedly sweet story about keeping secrets, and sharing secrets. And asking lots of questions. And creating book nooks. When her parents told nine-year-old Wren they were getting a divorce, they said it had nothing to do with her. But it feels like it has everything to do with her. She's the one who has to eat dinner at a desk in her mom's office now, instead of at the dining room table. She's the one who has to split her time between two houses and two parents. She's the one who has somehow lost her best friend. While her parents were working out the details of their divorce, Wren was sent to stay with her grand When her parents told nine-year-old Wren they were getting a divorce, they said it had nothing to do with her. But it feels like it has everything to do with her. She's the one who has to eat dinner at a desk in her mom's office now, instead of at the dining room table. She's the one who has to split her time between two houses and two parents. She's the one who has somehow lost her best friend. While her parents were working out the details of their divorce, Wren was sent to stay with her grandparents, so she missed all the usual summer activities with her friends, including her best friend Amber's birthday. And she didn't know how to talk to them about her parents, so she didn't talk to them at all. Not even a birthday card. 'Big & Little Questions (According to Wren Jo Byrd)' by Julie Bowe follows nine-year-old Wren as she navigates life after her parents' divorce. Having gone away for the summer without telling any of her friends why, she is hesitant to share that her parents have decided to get a divorce. Adding insult to injury is the fact that her supposed best friend, Amber, has made a new best friend, Marianna, and doesn't seem to want to have anything to do with Wren. Even though Wren is keeping a secret 'Big & Little Questions (According to Wren Jo Byrd)' by Julie Bowe follows nine-year-old Wren as she navigates life after her parents' divorce. Having gone away for the summer without telling any of her friends why, she is hesitant to share that her parents have decided to get a divorce. Adding insult to injury is the fact that her supposed best friend, Amber, has made a new best friend, Marianna, and doesn't seem to want to have anything to do with Wren. Even though Wren is keeping a secret from Amber, her worry about what will happen when they find out the truth trumps any common sense she may have. The divorce is clearly not her fault, but she feels diminished by it, and as though her friends will think less of her, so she keeps it a secret. It doesn't help that nine-year-olds can be extremely fickle, so Amber's sudden fascination in all things Marianna wears on Wren's sensibilities. Wren's mom makes life even harder when she requests that Wren and Marianna walk to the library together (where Wren's mom is the head librarian) every day after school so Wren isn't alone, due to the fact that both of Wren's parents will now be working after school and unable to be with her at home. At first, Marianna comes across as a spoiled, bratty diva. It is definitely possible for nine-year-olds to encapsulate these qualities; however, Marianna's way of speaking sometimes seemed too old for her age. Despite Wren's mistrust and dislike of Marianna from the get-go due to Amber and Wren's falling out, Wren learns that Marianna has some secrets of her own, and maybe - just maybe - they are more alike than Wren could have thought possible. In this novel by Julie Bowe, friendships are tested, secrets are kept and revealed, parents are annoying, and life is frustrating. Yet, through it all, the world starts to make more and more sense, and each character's struggle to find their own path results in finding ways to connect with others as well. This is a fast, sweet, and enlightening story that anyone who loves middle grade novels will truly enjoy. This was a story about dealing with change. Nine year old Wren learns her parents are getting a divorce and struggles to figure out how to deal with this. Then, on top of this devastating news, her best friend Amber is now snubbing her for the new student, Marianna. Since Bryd's parents have not openly told anyone about the divorce, Bryd does the same. Soon her small lie turns into a bigger and bigger one that threatens to cause even bigger issues. I think this was a very good book for third and This was a story about dealing with change. Nine year old Wren learns her parents are getting a divorce and struggles to figure out how to deal with this. Then, on top of this devastating news, her best friend Amber is now snubbing her for the new student, Marianna. I think this was a very good book for third and fourth graders. It seemed a very honest portrayal of how a young child would feel when their parents no longer live together. I really liked the characters and the way the story unfolded. I received a complimentary e book from the publisher in exchange for a review. This author captured an authentic voice of a young girl whose parents are divorcing. I love Wren and how she dealt with her big family changes, her friends, and telling the truth/dealing with consequences of lying. Her questions are some other kids are asking too and this is a highly recommended book for anyone, even if you don't have to deal with separated or divorcing parents, because it will make you a better friend to someone who is going through this tough time. This book teaches a very valuable lesson that I haven't found in another book for this age yet. It teaches that things aren't what they always appear to be. The grass isn't always greener on the other side. Amber isn't the only one unhappy with her life and hiding secrets. This book teaches that life becomes easier when we share our problems with others as we are usually not alone. Great book for middle school age children. The book title sums it up. The character deals and tries to understand the decisions of divorce. Sweet and sad. The story of Wren, 9 years old and reeling from her parents’ divorce. Nice emotional heft. Divorce is a big deal, and it totally changes your world. But what if you can keep it a secret? From your new teacher, your friends, and even yourself? This is a great middle grade book about dealing with divorce, friendships, and all the changes that happen at this age. The characters were very well-developed. Great voice and a lot of heart. This one had me turning the pages. A 9-year-old girl whose parents divorce decides to keep the event a secret. I enjoyed this book and would recommend it, but it wasn't a standout. My 10 year old daughter recommended this book to me. It is a sweet middle grade read about a family going through big changes. I would recommend it to parents who are divorcing. I liked this but I think it straddles an odd line for audience. It's long for a younger elementary reader, but Wren is nine. Normally, kids prefer to read about characters slightly older than they are, so it just seems a bit off. But, I could be wrong. It's great for capturing the complicated emotions of dealing with a divorce and the changing structures of friendships. Like any other student, Wren Jo Byrd, is excited that it is summer vacation. Her excitement is overshadowed when she finds out that her parents are getting a divorce and that she has to spend the summer with her grandparents. She is left with no time to say goodbye or tell her friends what has happened and where she is going. When she gets back, she finds out all the fun things her friends did all summer and what she missed out on. They inquire about where she was all summer, but Wren lies and says she was on vacation. She was not ready to tell everyone that her family was not a family anymore. As the school year progressed, she got deeper and deeper in to her lie by adding more and more "fibs" to her story. This book progresses through the life of a child who has to figure out how to navigate new family dynamics, new friendships, and the loss she feels about the separation of her parents. 1. Do you think Wren should have lied to her friends about her parent's divorce? Why or why not? 2. Why do you think she does not want them to know about her parent's divorce? 3. Come up with three questions to ask your mom, dad, grandparents, siblings, or friends to play the same question game that Wren and her dad played. 4. Have you ever hidden something from your friends or family and you did not know how to tell them the truth? How would you tell them the truth now? I was one of the lucky ones to read an advanced copy of this latest book by Julie Bowe. She's proven her mastery of the voice, sensibility, and struggles of 8-10 year olds in her prior series and carries that talent forward in this single title. Wren Jo Byrd (don't you love that name?) displays a distinctive present-tense narrative which reveals the intense emotions generated by her parents' announcement of their pending divorce. Ramifications cause ripples and raw-edged angst among friends and I was one of the lucky ones to read an advanced copy of this latest book by Julie Bowe. She's proven her mastery of the voice, sensibility, and struggles of 8-10 year olds in her prior series and carries that talent forward in this single title. Wren Jo Byrd (don't you love that name?) displays a distinctive present-tense narrative which reveals the intense emotions generated by her parents' announcement of their pending divorce. Ramifications cause ripples and raw-edged angst among friends and family. Readers will identify with Wren's reactions and ache with her until the eventual satisfying and realistic conclusion, whether they've experienced similar situations or not. Some questions seem like little things. What does your house look like? That seems like a small thing. But if your parents have divorced and you now have two homes, which house does that question refer to? How do you answer that question? What did you do over the summer? Again, that seems like a casual query, unless you spent it with your grandparents while your parents divided the contents of your home. For Wren, all these seemingly little questions cause incredible stress as her new school yea Some questions seem like little things. What does your house look like? That seems like a small thing. But if your parents have divorced and you now have two homes, which house does that question refer to? How do you answer that question? What did you do over the summer? Again, that seems like a casual query, unless you spent it with your grandparents while your parents divided the contents of your home. For Wren, all these seemingly little questions cause incredible stress as her new school year starts. To make matters worse, her best friend has made a new acquaintance over the summer who seems to have taken Wren's place in her affections. With her new visitation schedule with her father, how will she be able to enjoy sleepovers and weekend movies with her friends? If everyone finds out about the divorce, will it change how everyone looks at her? After things change in such a big way, can all the little things rearrange themselves into a new kind of normal? Readers who have experienced a similar change in their own lives will appreciate the struggles that Wren goes through, and recognize some of her feelings and reactions as being akin to their own. They will find themselves cheering her on and hoping that everything will work out well for her. Great for middle grade readers who enjoy realistic fiction with families and friends at center stage. I read an e-book provided by the publisher through NetGalley. Put another way — the children going through the life upheaval are understandably emotional but it's rare here for friends to turn on each other when one is going through an upset s But the kids at school have maintained their friendships through the thick and thin. Sure, sometimes families move away. Sometimes the move means a friendship becomes a long distance one via email and texting, and sometimes old friends are replaced by new friends. But it's very rarely the sort of drama portrayed here. Julie Bowe writes books for young readers including the Friends for Keeps series, the Victoria Torres, Unfortunately Average series, and Big & Little Questions (According to Wren Jo Byrd).